Do Learning Styles Teach Us Anything? There’s something irresistible about personality quizzes. And judging by the number of “likes” garnered by our recent Facebook post about learning styles, it seems that you feel the same way. The conversation that stemmed from the post led us to think more deeply about the validity of learning styles, and how (or if) they can help facilitate more effective learning. In the presentation business, we’re always looking for ways to communicate information in way that resonates with people, and motivates them to act—and a big part of that is learning how people learn. 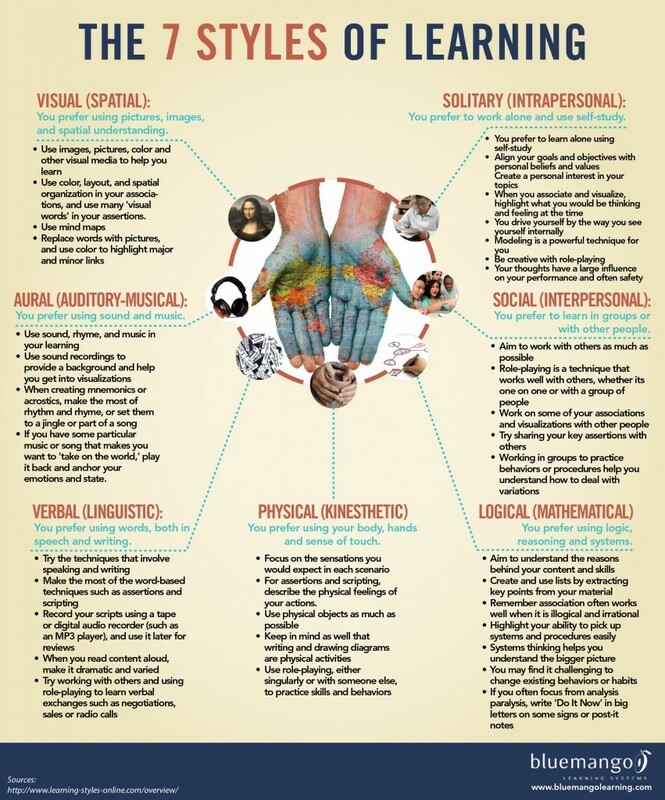 The learning style model you’ve probably heard of is known as the VARK model that describes the styles as visual, auditory, read/write and kinesthetic and was developed by Dr. Neil Fleming in 1987. Teachers were encouraged to use the model to create curricula that were effective for the most diverse group of students. The VARK model outlines four learning styles. The infographic we shared (pictured below) says seven. And one study recently showed that there are 70 different learning styles. In addition to the differing opinions on the subject, there have been criticisms of models that categorize individuals into these different styles. In a 2009 study, Hal Pashler from the University of California, San Diego, made the point that there hasn’t been much study on the adverse effects of learners being taught via the “wrong” style. For example, does a visual learner really learn less well when given information in a way suited best for verbal learners? The majority of the criticisms simply suggest that individuals are not limited to one learning style. That’s fair. People are complex. So, how can this information help us as presenters? Well, as a presenter, you must not view your audience as an amorphous blob to whom you can relate to by following a formula. But you can count on some core truths that are universal no matter who your audience is or where their preferences lie: they want to hear stories and they want you to understand what makes them tick before suggesting they try something new. You can use learning style research to get ideas about how to present your information in different ways, depending on your audience. They may not be limited to one style, but you can take a logical guess about which style will work best. For example, if I’m presenting to engineers or similar technically minded professionals, I’ll make the majority of my presentation logical and data-centric. That doesn’t mean I need to remove emotion and humor from my presentation – logical thinkers are human beings, after all, and quite often have a great sense of humor and irony. But if I were giving the same talk to designers, I would appeal to their visual passions a lot more, simply because I know they often see the world differently and have different passions than statisticians. The same goes for an audience of English professors who love to get lost in the written word, actors who love to role play, or personal trainers who want to get up and moving. Knowing your audience makes being a presenter—or a teacher of any kind—more interesting. If you had to give the same presentation or the same lecture repeatedly, without altering it for the audience, your job would be pretty boring. So relish in the task of knowing your audience and using your presentation to treat them like a hero—by making a deeply personal connection, not just a bullet list of main points.